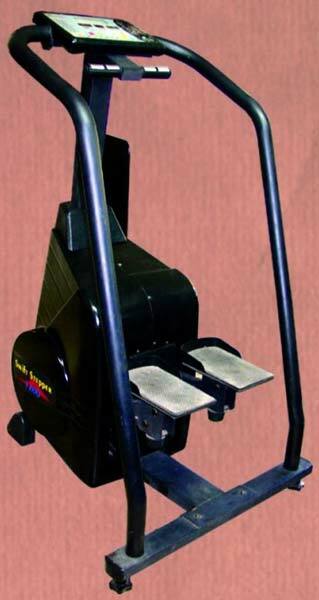 Contact us for excellent quality Cardio Exercise Stepper! The company is a preeminent Manufacturer, Supplier and Exporter of Cardio Exercise Stepper from Maharashtra. Exercise Steppers we make available have interactive dot matrix display and 3 Led windows for continuous feedback. Bulk orders of the Exercise Steppers are processed by us as per the specific requirements of the buyers. Interactive Dot Matrix Display and 3 Led windows for continual feedback. 1 Customs Program and Manual. Display Features : Elapsed Time, Calories Burned, Mets, Steps Per minute, Heart Rate, Distance, Work Stage, Load Level. User Capacity 150 kg, Continuous duty Resistance : Electro-Magnetic Braking, resistance braking. resistance braking.